Set the table before you begin, because this scrumptious dish will be ready to serve in only twenty minutes! With only three ingredients, this recipe will be your “go to” plan for hectic evenings when you simply don’t have time to “waist” in the kitchen. Low in fat and calories, but high on flavor, this is one the whole family will enjoy! Cut both ham steaks in half across the middle, making four steaks. Coat a non-stick skillet with cooking spray (I like Smart Balance Omega). Sear steaks over medium heat until they begin to brown, about four minutes. 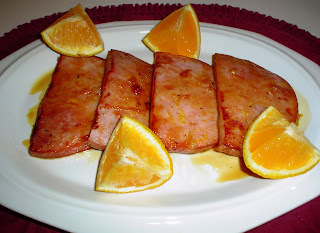 While ham steaks are cooking, wash the skin of the orange and slice it in half. Set one half aside for garnish. Zest the skin of the other half of the orange into a small bowl. Squeeze the juice from this half into the bowl, and add the agave nectar. Turn the ham steaks over, then pour the orange juice mixture over the steaks. Reduce heat to medium-low, and simmer for ten minutes, while you prepare side dishes. Do not cover the skillet. Arrange ham steaks on a platter, then drizzle the reduced orange nectar over the steaks. Cut the remaining half of the orange into wedges or slices to garnish the steaks. One serving equals one ham steak slice per person, (approx. 3-5 ounces). Serves four. Red potatoes, cut into chunks, boiled or steamed, seasoned with sea salt or your favorite salt substitute and freshly ground black pepper. (Fast-burning carb). One fist-sized serving per person. Steamed sugar snap peas, no seasoning needed. Approx. ¾ cup serving per person. (Slow-burning carb). Agave nectar is usually sold as organic, and it is also Kosher. It is naturally high in fructose and low in glucose, giving it a very low glycemic index—even lower than honey! Agave nectar is approximately one and one-half times sweeter than white sugar, meaning you’ll use much less, thereby reducing calorie intake. It dissolves easily, even in cold water, and will not solidify, giving it a long shelf-life. Agave nectar is all-natural, meaning it contains no chemical or processed sugars like sucrose, mannitol, high-fructose corn syrup, or maltose. It’s perfect for baking, cooking, using in coffee or tea, or even as a substitution for pancake syrup. Remember to always use less agave nectar than you would sugar or honey, as it’s much sweeter. You can always add more, to taste. Rhonda, this looks yummy! Thank you for sharing. I could use some new recipes. By the way, I've tried to become a follower, but for some reason the window doesn't want to pop open. I'll keep trying.